Rescuers use a crane to retrieve part of the landing gearsof the crashed Lion Air jet from the sea floor in the waters of Tanjung Karawang, Indonesia, Sunday, Nov. 4, 2018. 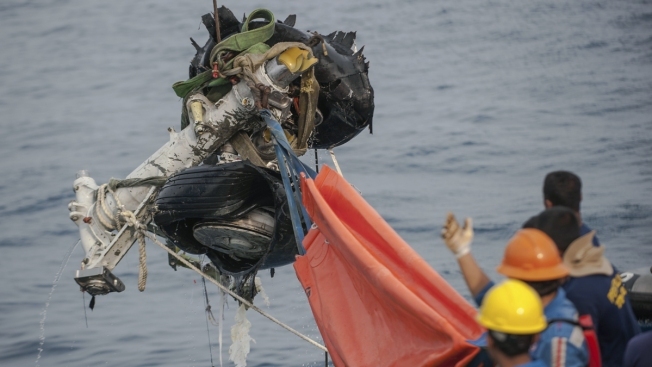 Investigators succeeded in retrieving hours of data from the aircraft's flight recorder as Indonesian authorities on Sunday extended the search at sea for victims and debris. A crucial sensor that is the subject of a Boeing Co. safety bulletin was replaced on a Lion Air jet the day before it plunged into the Java Sea and possibly worsened other problems with the plane, Indonesian investigators said Wednesday. Indonesia's National Transportation Safety Committee said it had agreed with Boeing on procedures that the airplane manufacturer should distribute globally on how flight crews can deal with "angle of attack" sensor problems following the Oct. 29 crash that killed all 189 people on board. The sensor keeps track of the angle of the aircraft nose relative to oncoming air to prevent the plane from stalling and diving. Soerjanto Tjahjono, chairman of the transport safety committee, said Wednesday that airspeed indicator malfunctions on the jet's last four flights, which were revealed by an analysis of the flight data recorder, were intertwined with the sensor issue. "The point is that after the AOA (sensor) is replaced the problem is not solved but the problem might even increase. Is this fatal? NTSC wants to explore this," he said. Lion Air's first two attempts to address the airspeed indicator problem didn't work and for the Boeing 737 MAX 8 plane's second-to-last flight on Oct. 28, the angle of attack sensors were replaced, Tjahjono said. On that flight, from Bali to Jakarta, the pilot's and copilot's sensors disagreed. The 2-month-old plane went into a sudden dive minutes after takeoff, which the pilots were able to recover from. They decided to fly on to Jakarta at a lower than normal altitude. Indonesian investigators said their flight procedure recommendations to Boeing were based on how the flight crew responded to problems on the Bali to Jakarta flight. "There are some things that we ask for explanation and some that we ask to be removed, and there has been an agreement between NTSC and Boeing to release a new procedure to all Boeing 737 MAX users in the world," he said. The plane hit the water at very high speed just 13 minutes after takeoff from Jakarta. Its flight crew had requested permission to return to the airport several minutes after taking off.